Check below for visual reference to the most commonly found snakes in Hong Kong to help with quick identification. Click on the picture for detailed information on the species you've found. If you don't find your snake here go to the ALL SNAKES PAGE or if you know the name and want the details you can use the onsite search below. 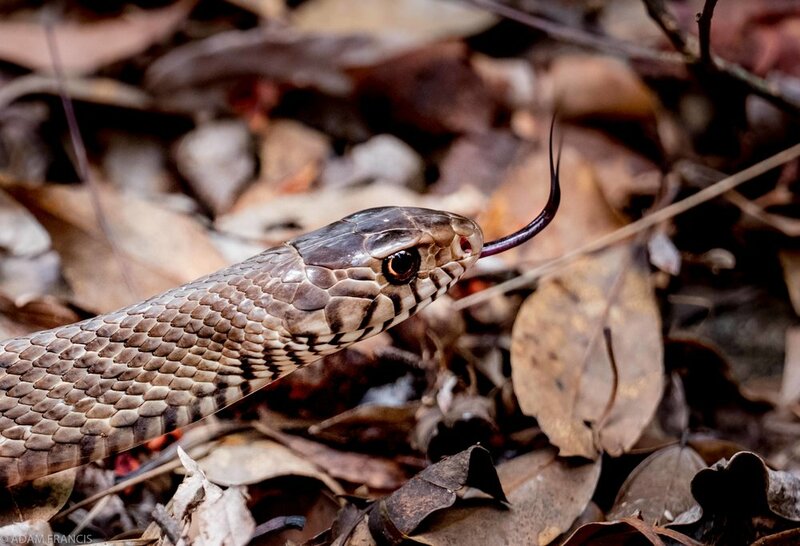 There are 52 different snake species in Hong Kong, and here we set out to identify the most common dangerous and venomous species in a step by step guide. HOW MANY KINDS OF VENOMOUS AND DEADLY SNAKES ARE THRE IN HONG KONG? 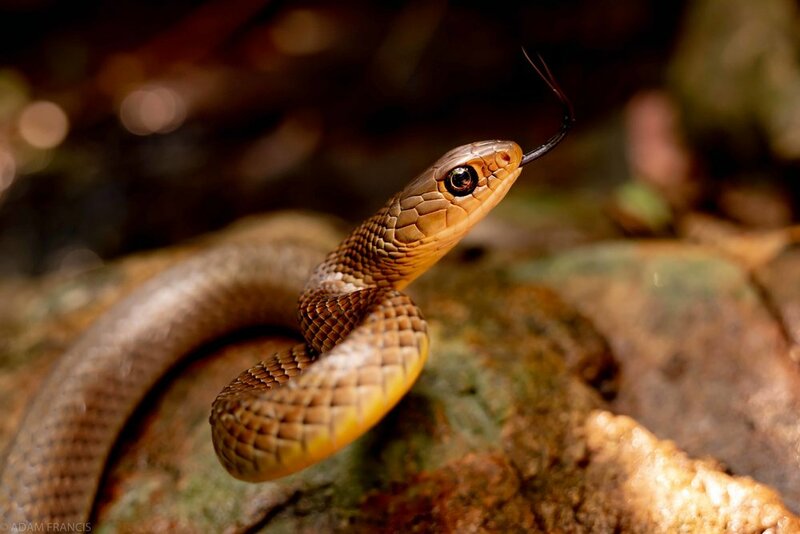 Six land species can inflict life endangering bites: the Banded Krait, Many Banded Krait, Chinese Cobra, King Cobra, Coral Snake, and the Red Neck Keelback. The two other venomous snakes - both pit vipers, the White-Lipped and Mountain Pit Viper - have bites that can cause extreme pain and swelling. Six other snakes have venom fangs at the back of the jaw, but are not known to produce much reaction in humans. The Common Rat Snake and the Burmese Python are not venomous, but do get very large, and their teeth can cause nasty cuts and gashes. QUESTION 1: IS IT BRIGHT GREEN? Have a good look at the head and neck. The Greater Green has a more elongated head with much larger scales, and no neck. The White-Lipped Viper has a triangular-shaped head with many small scales, a thin obvious neck, and orange-yellow or red eyes, with a slit pupil and they have a deep nasal pit. The other key distinguishing feature is the Pit viper has a reddish-brown streaked tail, see the White-Lipped Viper page for more photos. The White-Lipped Viper will strike readily, with a very painful bite, and is responsible for 90% of Hong Kong's ~30 envenomations a year. Whilst the Greater Green is most active during the day the viper is primarily nocturnal and they end up biting people because they like to ambush their prey, so they do not normally move when they hear you, and rely on their camouflage to remain undisturbed. They can also "see" and can strike at night using their heat sensing pit organs. See the Greater Green page for a summary of these differences along with other facts. QUESTION 2: DOES IT HAVE A RED NECK? If it does, then it is the venomous Red Neck Keelback. Olive green with a red patch just behind the head, with yellow and black flecks throughout the body. The red marking can be quite faded in older adults. Not aggressive, but bites inflicted with the rear fangs – though rare - can be lethal. Often seen hunting frogs and toads during the day. Adults can secrete a toxic white substance from a groove in its neck making it unique in Hong Kong and rare as an animal that is both venomous and poisonous. QUESTION 3: DOES IT HAVE BLACK BANDS AROUND ITS BODY? Many snakes in Hong Kong appear to have bands, but the only strongly banded venomous ones are the deadly Kraits and the Coral Snake. The King Cobra is also banded, but not to the same contrast. 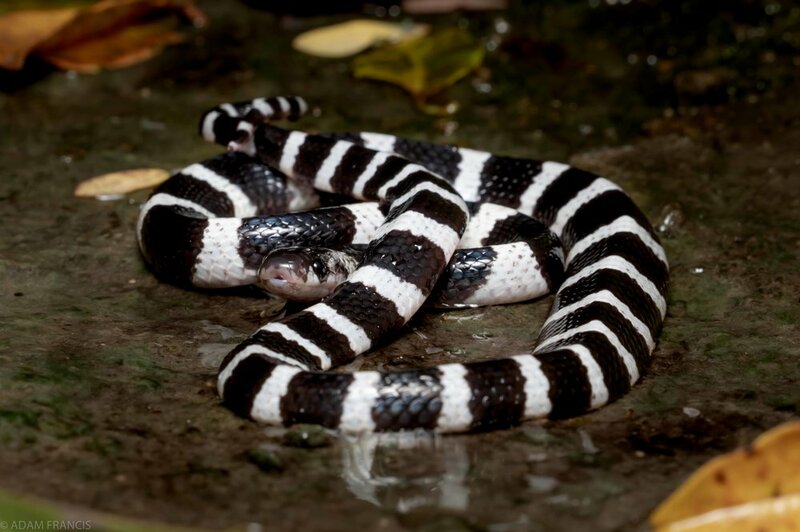 The Many Banded Krait, strongly banded in black and white, is quite common in Hong Kong, and likes to eat other snakes. This snake has an extremely toxic venom, which leads to respiratory paralysis and heart failure. We have watched these snakes hunting, and they will often completely ignore your presence. There is also the very docile Banded Krait which are now rare due to loss of habitat. These easily recognisable alternating black and yellow banded snakes, whilst not aggressive, can also be fatal. You can also clearly see the triangular "ridge" type shape of the Kraits in this picture. The Many Banded Krait can be confused with the harmless Banded Wolf Snake or Mountain Wolf Snake. The foremost world expert on Kraits was killed and died a horrible death due to this mistaken identity, so do not take any risks! Here is a photo comparison of a Many Banded Krait and a Banded Wolf Snake to highlight how easy they are to confuse. Also the juvenile King Cobra is strongly banded, displaying yellow bands on black. McClelland's Coral Snake shown above is another easily recognisable - but very rare - lethal snake in Hong Kong. Young are a much brighter red with thinner bands. It has a white band behind the eyes on the head. It was named in honour of Dr John MacClelland a naturalist working for the East India Company. QUESTION 4: DOES IT HAVE A HOOD? Then it is a cobra. Either the common Chinese Cobra, or the rarer King Cobra. The hood from behind, clearly showing the "spectacles" of the Chinese Cobra. The Chinese Cobra can be a medium sized snake a little over one meter long when mature, mostly black, but sometimes grey or gold in color. A short, wide hood, usually with white eye spots, or “spectacles”. Active day and night. Highly dangerous, bites may cause tissue necrosis and death. Will usually try to escape, but if confronted will raise its forebody, spread its hood, hiss, and strike readily. Some snakes have been known to spit venom so do not get too close with your phone to take a picture! 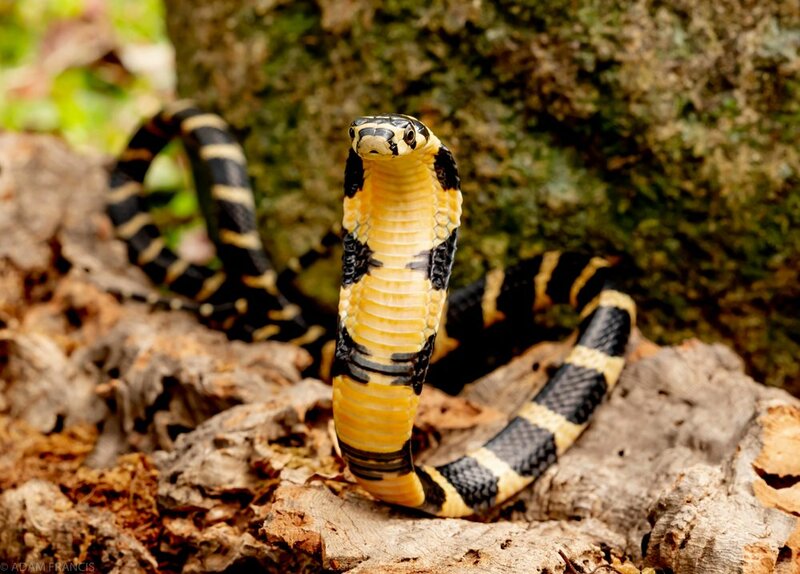 The rare King Cobra pictured below is lightly banded when mature, juveniles strongly so with yellow bands on black and unlike the Chinese Cobra it is without eye-shaped markings on the hood. Mainly out during the day. Extremely dangerous. Can be black, grey, brown or even golden, with or without bands or spots. QUESTION 5: IS IT A LARGE DARK COLORED SNAKE? Then it is probably either a deadly cobra OR a harmless ratsnake, and it is not always easy to tell them apart quickly without a closer look, and both snakes can have different colourations and morphs from grey to black to golden. The rat snake has no hood, but this is not always easy to see. Perhaps the most distinctive feature is that the scales just along and under the eyes have a black edge on the Common Rat Snake seen here in the picture, and that “band” behind the eye often helps with an ID. The Cobra also has larger scales on top of its head, though this is more of a distinction to be made by experienced observers than the casual naturalist. This information courtesy of www.wildcreatureshongkong.org, check out the site for more great info on Hong Kong's wildlife! Move away from the snake and call emergency Services at '999' and get to a hospital. Seek medical care without delay. Even a bite from a non-venomous snake may require a tetanus shot or booster. Take note of the snake's appearance. This is important, as treatment varies. Don’t try and catch or kill the snake, but take a picture if you can, or try and remember its shape and colour. A positive snake ID can really help the doctors to help you better. Be as still as possible. If you're waiting for help to arrive, lie down on your back and take deep, steady breaths. Clean the wound with water. Be gentle. Remove clothing, jewellery, or constricting items. If you don’t know your snakes, it is better to immediately apply a pressure bandage or a piece of cloth around the bite as well as above and below the bite, as recommended by the British Army. Elastic wraps that you use for ankle sprains work well. Wrap it snugly, but you should still be able to put a finger under the bandage. However in some cases wrapping may not be advised. For example if the bite is from a snake with hemotoxic venom like the White Lipped Viper it could result in worse tissue damage, as you are concentrating the venom in one place and as most bites in Hong Kong are from this snake, it is worth noting. No food or drink – especially not alcohol. No stimulants or pain medication. Receive antivenom. Experienced doctors use with great caution as it carries its own risks. Wait it out. If you are far from help and waiting for them to come to you, then simply get as comfortable as possible and wait for the venom to leave your system. Almost half of all bites are “dry bites”, which means no venom was injected and it is possible that the snake did not inject enough venom for the bite to be fatal. I HAVE A SNAKE IN MY HOUSE/GARDEN, WHAT SHOULD I DO? If you are not highly experienced with snakes then it is a good idea to have it removed. You can call the police on '999' who will then contact a paid snake collector. It then goes for release to Kadoorie Farm and they deserve a BIG “well done” both to the government and Kadoorie Farm for putting in place a police coordinated rescue service.